Does an infinite and all-powerful God really care about the everyday concerns of people? Jim Samra answers with an unequivocal and enthusiastic "Yes " in this guide to hearing God's direction in everything. From the trivial and mundane to the life-changing, God cares about it all because it concerns his creatures, his creation, and his kingdom. 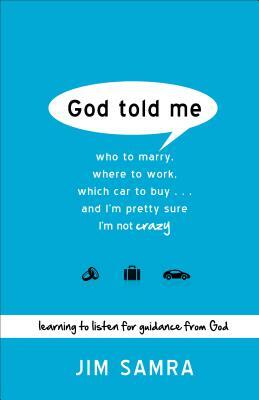 In this unique book, Samra unpacks biblical passages and shares fascinating and surprising true stories about God's guidance, encouraging readers to keep up a running conversation with their creator, to search for guidance in Scripture, and to pay attention to apparent coincidences. Readers who want to make godly decisions about the big things (where to live, where to go to school, where to work, who to marry) and the seemingly little things (which car to buy, which song to sing in church, who to talk to, what to say) will find a gifted and encouraging guide in Samra. Jim Samra (MTh, Dallas Theological Seminary; DPhil, University of Oxford) is senior pastor of Calvary Church in Grand Rapids, Michigan, a nondenominational church with an average weekly attendance of 4,000 adults. He is the author of The Gift of Church and Being Conformed to Christ in Community.